After an agreement was announced last week that will keep Comic-Con International in San Diego through 2018, the giant pop culture extravaganza opened its doors to throngs of fans on Preview Night, July 8. While forthcoming blockbuster movies like Star Wars and Batman vs Superman, and new TV Shows like Supergirl and Heroes Reborn dominate the hype (and the outdoor signage) at Comic-Con, there’s plenty of old-fashioned book publishing and marketing going on. Originally a perk for fans with four day passes that gave them first-shot at books and merchandise, the three-hour Preview Night (6 p.m. to 9 p.m.) now attracts tens of thousands of fans. The huge Wednesday evening crowd looked more like the turnout on Saturday, usually the biggest attendance day of the show. While there’s plenty of blockbuster media franchises spread throughout the hall, there’s also lots of small publishers like Baby Tattoo, an artbook publisher and producer of art-events, offering a list of beautifully produced books. Publisher Robert Self was showing off new titles like Slang Aesthetics, a hardcover exhibition catalog by painter and underground comics legend Robert Williams. Boom! Studios, a larger indie comics house, was featuring advance copies of The Art of Mouse Guard, a $60 ten-year anniversary hardcover tribute volume to the fantasy comics series that collects the work of creator David Petersen. Another large indie, Top Cow, a partner studio of Image Comics, known for supernatural adventure series like The Darkness and Witchblade, showed off titles that publisher Matt Hawkins and newly appointed story editor Bryan Hill—who also team to write a number of Top Cow’s hit comics—described as “not what you’d expect from Top Cow.” Those books include Postal, a crime thriller, Think Tank, a science-fiction thriller, and Genius, the timely story of an urban black community in revolt against an oppressive police force by Marc Bernardin, Adam Freeman and artist Afua Richardson. Comic Book Legal Defense Fund, a nonprofit that fights censorship, has stepped up its publishing program. Editorial director Betsy Gomez had copies of the second issue of Defender, a free quarterly magazine focused on comics and the freedom to read, and the newly launched Comic Book Club Handbook, a collaboration with Comic-Con that gives advice and tips on how to organize book clubs for graphic novels. Top Shelf used Preview Night to show off advance copies of Bacchus Volume 1, the first of two 500-page omnibus volumes collecting Eddie Campbell’s much acclaimed fictional series starring Bacchus, the Roman god of wine and revelry, and chronicling his misadventures in the contemporary world. Originally published by various publishers in the 1980s, these two massive editions collect the entire series and offer notes and commentary on the series from Campbell. There’s also a hardcover exclusive show edition of the book called Private Reserves, produced just for Comic-Con, that features all kinds of additional content. Top Shelf is also involved with an unusual event planned on Saturday organized by Top Shelf. The company is the publisher of March, the bestselling graphic memoir of Civil Rights leader, Rep. John Lewis, who seems to thoroughly enjoy the whole comics convention experience. Lewis and coauthors Andrew Aydin and artist Nate Powell, will be featured on a panel on Saturday and Top Shelf marketing director Leigh Walton said the congressman plans to cosplay (dress up as a comic book character) for the event—as himself. 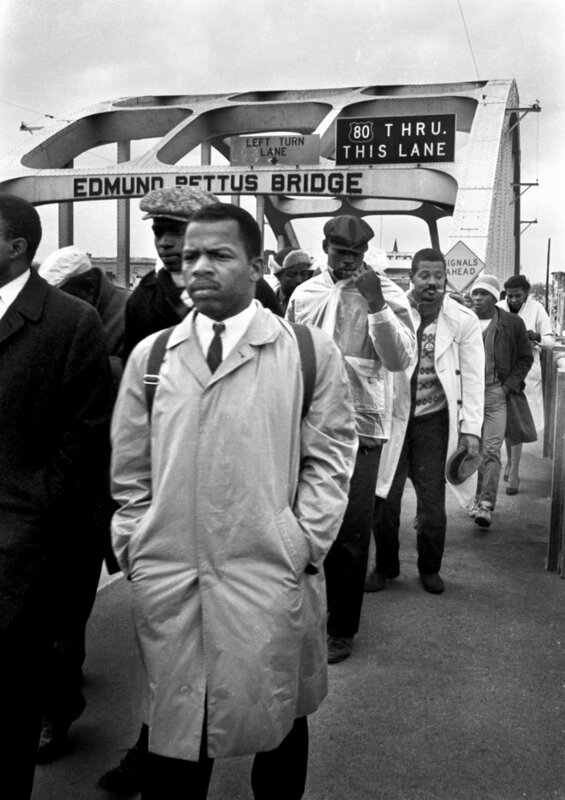 Lewis, Walton explained, plans to wear the iconic trench coat, black suit and tie and backpack (look him up online) he wore on Bloody Sunday, the historic, violently suppressed Civil Rights march across the Edmund Pettus Bridge in Selma, Ala., now made even more famous by its depiction in the recent movie. Indeed, Walton said, after the panel the congressman plans to lead a march of school children at the panel down to the exhibition floor where he will sign copies of volume two of March. History brought to life at Comic-Con.